Level up your next summer barbecue blowout by trying out Embers Ajax Punch recipe featured in Nashville Scene’s latest piece titled “Drink Up Summer: Your Next Barbecue Will Be a Blast With These Recipes” by Chris Chamberlain. Nashville Scene highlighted the easy-to-make cocktails, punches, and boozy melons created by Nashville’s best bartenders from Embers Ski Lodge, Nashville Ice Lab, Lockeland Table and many more. Make 1 liter of simple syrup by adding 4 ¼ cups of white sugar to 4 ¼ cups warm water. Stir until sugar is dissolved and set aside to cool. Mix 14 cups pureed watermelon together with 7 cups pureed cucumber (save the watermelon rind for garnishes), and then combine the melon/cucumber puree with the simple syrup. Yield will be roughly 2 liters. In a large punch bowl, combine the Bacardi Silver Rum and the Ajax syrup and stir. Add ice to individual glasses and fill glasses three-quarters of the way with punch. Top off the glass with chilled sparkling wine and stir quickly. 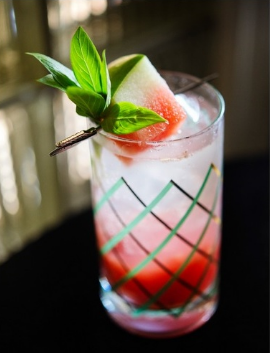 Garnish with watermelon spear and mint sprig. Read the full article and get more recipes here.